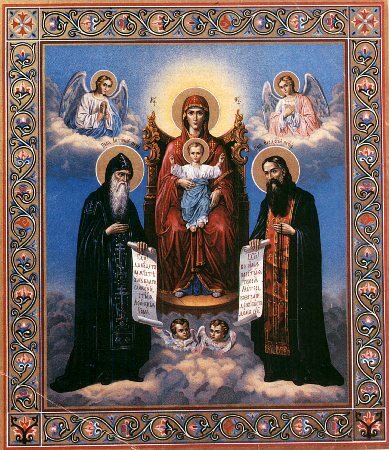 The Pechersk Icon of the Mother of God with the Monks Antonii and Theodosii depicts the Mother of God sitting upon a throne with a crown upon Her head. Her hands She places upon the Monks Antonii and Theodosii upon bent knee. Upon the knees of the Mother of God – is the God-Infant, blessing with both hands. Along the sides of the throne are bowing Angels.